The Slovak Information Service (SIS) is a state authority that uses the most sophisticated human and technical resources to protect the Slovak Republic and its interests. In compliance with the Act 46/1993 Coll. on the Slovak Information Service it was established as a civil intelligence and security service. The SIS Act defines its tasks, position, organisation, external oversight system by the National Council of the Slovak Republic, obligations and rights. Within its competence and powers, SIS collects and provides the legally defined recipients with the information on the most critical threats to the constitutional system, internal order and security, as well as the information focused on the protection of foreign political and economic interests of the state. 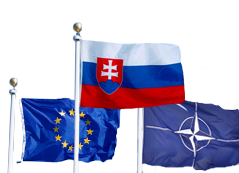 SIS averts security threats to the Slovak Republic and the EU and NATO member states and protects the international community. SIS closely cooperates with partner intelligence services and international organisations.